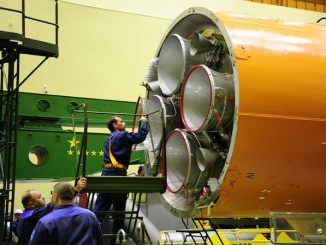 Russian engineers will replace rocket engines on two Soyuz rockets assigned to send a batch of supplies and the next crew to the International Space Station after an investigation revealed foreign objects or a manufacturing defect led to the crash of a Progress cargo craft on launch in December, according to Russian media reports and a statement from the Russian space agency. 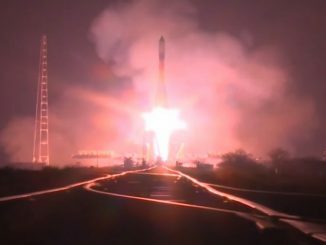 Russian mission control said Thursday an unpiloted Progress space station supply ship carrying nearly 5,400 pounds of rocket fuel, food, water and a new spacesuit burned up in Earth’s atmosphere shortly after it blasted off from Kazakhstan, and evidence points to a problem with the third stage of the cargo carrier’s Soyuz booster. 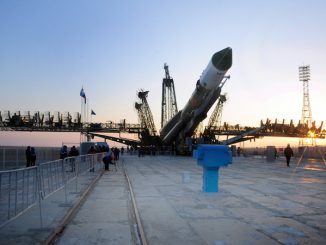 Russia’s next Progress cargo freighter rolled out to its launch pad in Kazakhstan on Tuesday in a final move before blasting off Thursday at the tip of a Soyuz rocket to resupply and refuel the International Space Station.